Elections to the United States House of Representatives were held in 1866 to elect Representatives to the 40th United States Congress. The elections occurred just one year after the American Civil War ended when the Union defeated the Confederacy. The 1866 elections were a decisive event in the early Reconstruction era, in which President Andrew Johnson faced off against the Radical Republicans in a bitter dispute over whether Reconstruction should be lenient or harsh toward the vanquished South. Most of the congressmen from the former Confederate states were either prevented from leaving the state or were arrested on the way to the capital. A Congress consisting of mostly Radical Republicans sat early in the Capitol and aside from the delegation from Tennessee who were allowed in, the few Southern Congressmen who arrived were not seated. Johnson, a War Democrat, had been elected Vice President in the 1864 presidential election as the running mate of Abraham Lincoln, a Republican. (The Republicans had chosen not to re-nominate Hannibal Hamlin for a second term as Vice President). Lincoln and Johnson ran together under the banner of the National Union Party, which brought together Republicans (with the exception of some hard-line abolitionist Radical Republicans who backed John C. Frémont, who eventually dropped out of the race after brokering a deal with Lincoln) and the War Democrats (the minority of Democrats who backed Lincoln's prosecution of the war, as opposed to the Peace Democrats, or Copperheads, who favored a negotiated settlement with the Confederates). After the assassination of Lincoln, Johnson became President. He immediately became embroiled in a dispute with the Radical Republicans over the conditions of Reconstruction; Johnson favored a lenient Reconstruction, while Radical Republicans wanted to continue the military occupation of the South and force Southern states to give freedmen (the newly freed slaves) civil rights (and the right to vote). Johnson stumped the country in a public speaking tour known as the Swing Around the Circle; he generally supported Democrats but his speeches were poorly received. The Republicans won in a landslide, capturing enough seats to override Johnson's vetoes. Only the border states of Delaware, Maryland, and Kentucky voted for Democrats. Recently Reconstructed Tennessee sent a Republican delegation. The other 10 ex-Confederate states did not vote. 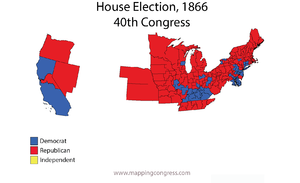 As a percentage of the total number of seats available in the House of Representatives, the Republican majority attained in the election of 1866 has never been exceeded in any subsequent Congress. The Democratic Party was able to achieve similar success only in the political environment of the era of the Great Depression in the 1930s. The party affiliations of the 4 Representatives elected in Texas' rejected elections are unknown. Democrats gained one seat this election in Ohio. It was later contested and awarded to the Republican for a net gain of zero. ^ Excludes states readmitted after the start of Congress. ^ a b Including late elections. ^ a b c Includes 1 Independent Republican, Lewis Selye, elected to NY-28, and 1 Conservative Republican, Thomas E. Stewart, elected to NY-06. ^ One Conservative member, Charles E. Phelps, elected to MD-03. ^ a b Previous election had 3 Unionists. ^ a b One seat remained vacant throughout the 40th Congress. ^ Previous election had 4 Unionists. ^ 8 Unionists in previous election. ^ One Conservative member, Nathaniel Boyden, elected to NC-06. ^ After readmission of 7 States. ^ Previous election had 18 Unionists. ^ a b c Morgan (D) was initially seated (and thus is counted towards the party totals at this article), but the election was contested and the seat was subsequently awarded to Delano (R) during the 40th Congress' second session. ^ Martis, pp. 120–121; Dubin, p. 209. ^ Smith, Joseph P, ed. (1898). History of the Republican Party in Ohio. I. Chicago: the Lewis Publishing Company. pp. 228, 229. Hans L. Trefousse. Andrew Johnson: A Biography 1989. Edward McPherson, The Political History of the United States of America During the Period of Reconstruction (1875) large collection of speeches and primary documents, 1865–1870, complete text online (the copyright has expired). This page was last edited on 24 December 2018, at 22:16 (UTC).